When is the last time you visit a zoo? Last year? Secondary school? Or you haven’t? No matter when is the last time you visit, Zoo Melaka always has something new to offer you. Being second biggest zoo in Malaysia, the zoo is managed by The Department of Wildlife and National Parks (PERHILITAN) whom have done a lot of development and upgrading the zoo infrastructure. 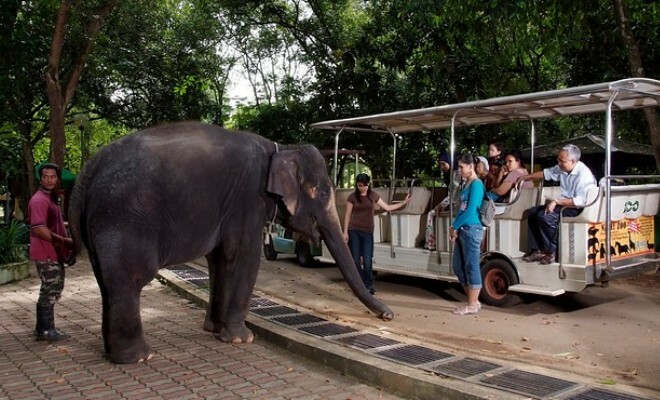 Only beaten by Zoo Negara, most people who have visited Zoo Melaka agreed that it has better and a lot more animals compared to its size. Being smaller has an advantage actually, a family can easily roam around, from section to section while enjoying the view of rare animals like tiger, White Rhinoceros, Asian Elephants, Red Panda , the Molurus Python, the Grey Wolf, the Mongolian Wild Horse, the Green Tree Python, the Giraffe and that is just to name a few from 1200 varieties of species. Beautifully decorated, the surrounding of natural trees, sound of animals will bring a peaceful feeling as close to nature as possible. Garnished with huge trees, colorful flowers and friendly environment is a must visit zoo for all fauna and nature lovers. Although situated a bit far from town of Melaka, it is a place suitable for family trip, youth, children or perhaps a couple who wish to have extraordinaire date throughout a day. Perhaps night too! Yes, they open in the night for a remarkable journey throughout the zoo when all the wildlife start to show their true color. Most of the animal is a nocturnal, which by simple meaning, they ‘party’ in the night (like human do!). Tigers will start roaming, birds singing, fox and the night crawler will start lingers out from their hiding hole in the day. Another zoo also opening at night is the Taiping Zoo located in Perak, this zoo is also one of the must visit zoo in the Malaysia. 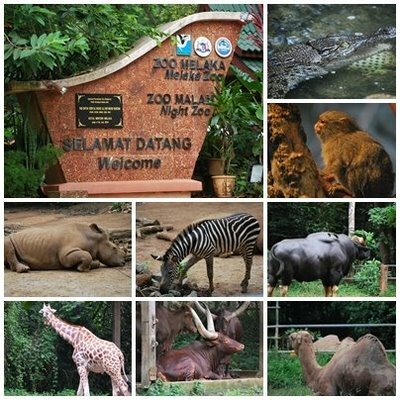 Zoo Melaka is not just meet the eye, for they also cater for captive breeding and animal rescue mission. Local threatened species, for example, tiger, panther, tapir, barking deer and many more other is successfully breed here. They also organize a animal rescue party like keeping wild endangered tiger or a lost elephant. Perhilitan also carried their research on medical treatment and behavioral studies here. If you are not into walking by your own in the beautifully made pathways, tram service also available for those in need. You can watch all the animals in comfortable of seating inside the window-less tram. For those with brave-heart, there is a photo shoot session with the Orang Utan, elephant and also snakes. Do drop a visit to Zoo Melaka and bring your children along, or perhaps bring out the children inside you. It will bring a lot of sweet memories and educational trip.